Sprint Corporation has launched a brand new unlimited plan in the USA. The fourth largest telecom provider in the country has undercut its competitors by its aggressive pricing. Sprint’s Unlimited Freedom pack will provide unlimited calls, messaging and the internet for two lines at an affordable price of $100. The latest unlimited plan costs $60 for a single connection and $40 for another line. The next three to ten lines will cost you $30 each. Both new and present customers can avail the new tariff. On the top of this, Boost Mobile, the prepaid wing of Sprint has launched two new unlimited plans for the contract-less users. The Unlimited Starter plan of Boost offers limitless calling, texts and music streaming with 1 GB of 4G LTE data for a month. You can purchase additional 4G LTE data volumes by paying $5 per GB. The next plan called Unlimited Unhook’d provide unlimited 4G LTE data on top of all the benefits of the Unlimited Starter. In the Unhook’d plan, the video and music streaming will be optimized at 480p+ resolution and 500kb/s respectively. Any additional line will cost you $30 each for both the plans. The Unlimited Freedom pack is claimed to be the cheapest unlimited plan among all the major telecom carriers in the US. Recently, T-Mobile announced their unlimited plans which cost $70 per month for a single line which is $10 more than that of Sprint. 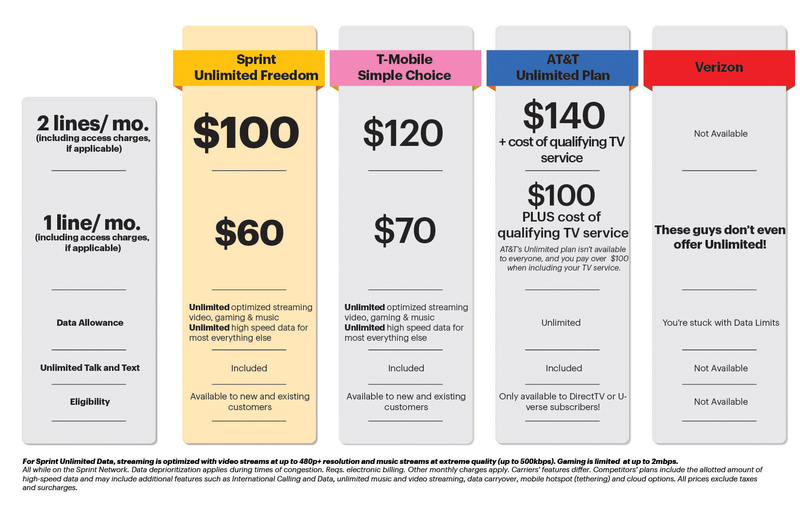 If you take two lines with T-Mobile’s unlimited plan, you need to pay $120 in comparison to $100 for the same in Sprint. Both the wireless network providers provide 480p video streaming and 500kb/s audio streaming in their unlimited packages. While the users of T-Mobile will get an option to upgrade their video streaming quality by paying an additional $25 each month, Sprint hasn’t specified any such upgradation facility. Apart from the pricing, T-Mobile and Sprint have identical benefits and both offer truly unlimited talk, message, and 4G LTE data without the perks of any average cost or capping of data after a certain volume. T-Mobile also offers some added utilities like Mobile Without Borders, Stock Up, Carrier Freedom, Simple Global, WiFi Unleashed and T-Mobile Tuesdays. Just a couple of days ago, AT&T launched a number of wallet-friendly data packs with zero average costs and Verizon increased the prices of its data plans but added more data volumes to those packs.